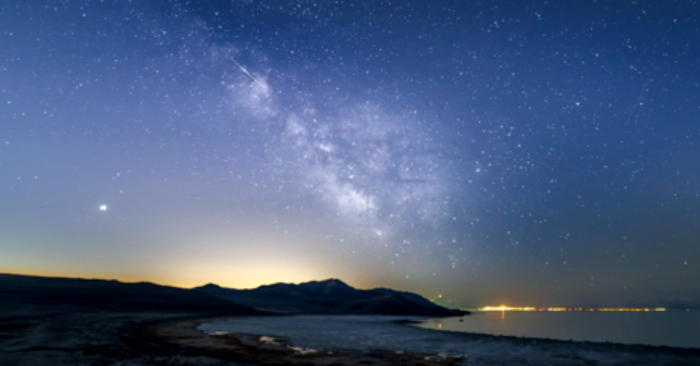 The Milky Way arches across the sky as seen from Antelope Island State Park. Photo by Dan Ransom. Despite the full moon this week we still have a plethora of sky candy for you to feast your eyes upon. Everything from constellations to planets, from the milky way to dark nebulae; all are at your fingertips and we will show you how to find them. Though the number has dwindled a bit, we still have planets for you to gaze upon aided or naked eye. Jupiter is still partnered with Virgo. Saturn rests between Sagittarius and Ophiuchus and both are still starting to rise into the sky shortly after sunset. Of the morning planets Venus, in Pisces, still shines mid-dawn. One night sky sight that never ceases to amaze me is the view we get of our great Milky Way galaxy. We are fortunate to exist where we do, on the Orion arm, also known as the Orion Spur. It is one of the several arms of our spiral galaxy. Due to our location and orientation, we have the unique ability to view inward towards the center of our galaxy. Depending on the level of dark sky in which you live, the Milky Way can appear as anything from a halo of nebulosity around bright stars to a cloudy band stretching from horizon to horizon. In dark skies ranging from 1-5 on the Bortle Scale, the galaxy is seen as huge pockets of star clusters and star glow broken up by a dark band known as the Great Rift. This rift is comprised of overlapping dust clouds that exist between our solar system and the next closest arm, the Sagittarius Arm. Similar to the rifts found in the Milky Way are the dark patches in the Coalsack Nebula. It is known as a dark nebula and observed in the constellation Crux from the southern hemisphere. A dark nebula is a type of interstellar cloud with dust so dense that light from surrounding and nearby stars have trouble penetrating the mass. In some sections, it may look as though no stars exist at all. It is only with the help of infrared technology that we can see the stars and formations that lie beyond the darkness. One might think that the lack of stars means it is dead-space but in fact, these dark nebulae have been found to be the nurseries for stellar and planetary development. Such is true for a more common birthing place, the Pillars of Creation in the Eagle Nebula within the constellation Serpens. We know from studying our own solar system that our planets and moons evolved from the dust in the accretion disc of our sun over four billion years ago. It makes sense that areas displaying high quantities of dust could be similar playgrounds of creation. The Coalsack Nebula can be viewed via naked eye in dark skies by looking for the two brightest stars in Crux; alpha and beta Crucis. Though not as pronounced, there is a Northern Coalsack Nebula off of the star Deneb in the constellation Cygnus. As we make our way towards summer, we find several of our more expressive constellations rising with our Milky Way. In both hemispheres, near Saturn, Scorpius rises forming the well-known scorpion of the sky accompanied by Sagittarius, the teapot. Both constellations are a treasure trove of Messier objects should you have binoculars or other telescopic equipment at your disposal. Those with telescopes can also play around in Jupiter’s backyard of Virgo, home to the great Virgo cluster of galaxies. Should you go out observing this week, take into consideration our full moon on June 9. Despite being at apogee, furthest point from the earth, on June 8 it can still pack an illuminated punch and may make observing some of these delights a bit more challenging in even the darkest of skies. Be sure to check online for your location’s moon rise and moon set times to ensure optimum dark sky observing. Check in with us next week when we talk about some of the more obscure constellations in the night sky as well as upcoming meteor showers and the upcoming summer solstice.